Gullibility and betrayal: two elements of popular entertainment that are as old as Shakespeare yet as contemporary as House of Cards. And they flourish not only in seats of power. 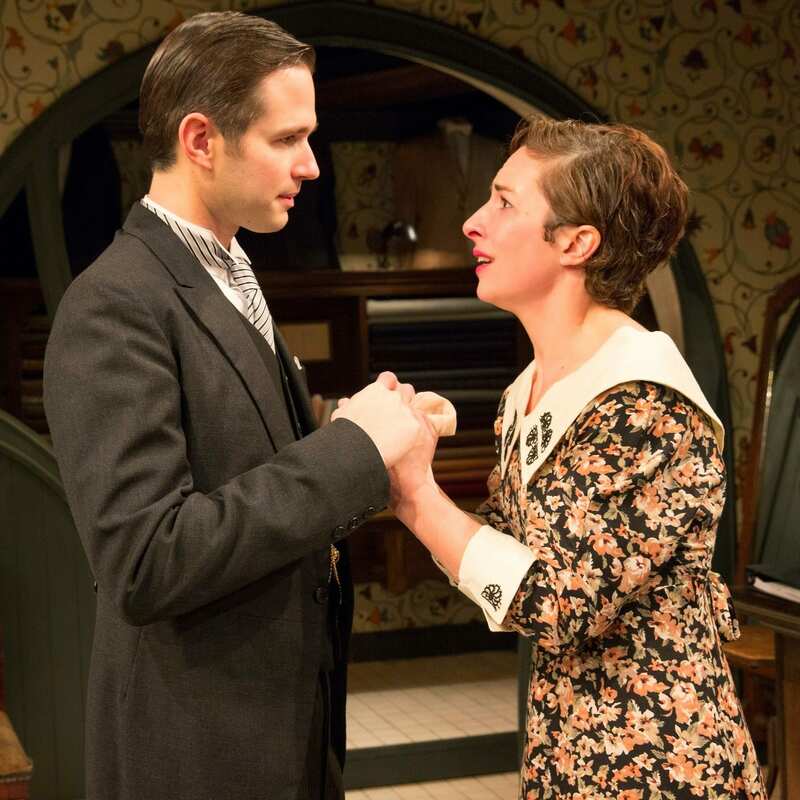 They can bloom as well in a small haberdashery in downtown Budapest, as proven in spades by the Mint Theatre’s handsome revival of Ferenc Molnár’s 1917 Hungarian romantic comedy, Fashions for Men. Our gullible protagonist is Peter (Joe Delafield), the shop’s owner. He’s just a guy who can’t say no, extending too much credit to his customers, too much good will to his employees, and too much blind faith toward his mate. When warned that he only sees the good side of people, he remarks that it’s “the only side they show me.” That declaration quickly proves to be false when his wife Adele (Annie Purcell) informs him that not only has she spent all his money, she is also leaving him to marry his best salesman, Oscar (John Tufts). Peter can only find it in himself to wish them well (Passion is not his fashion, you see.). Fortunately/unfortunately, Peter has a wealthy customer who likes him. The Count, a.k.a. his Excellency (Kurt Rhoads), takes pity and gives Peter a job at his country estate, where cows roam the fields and cheese is the cash crop. The shop’s pretty young flirt, Paula (Rachel Napoleon), also comes along for the ride, with the Count in full seduction mode and Peter staying up nights to protect her honor. Their country life is short-lived though. Fate, luck and Peter’s principles soon enough earn him and Paula a return to their former lifestyle, where they are granted a happy ending. It is no easy feat to draw laughs and sighs from a 98-year-old play translated from an Ugrian language. This production does it by serving up a veritable goulash of comic stylings, from broad to subtle. Some of these, including some funny offstage barnyard noises, are the work of director Davis McCallum. Others stem from the structure and rhythm of the play which indeed feel foreign. The characters, at first, seem cartoonishly one-dimensional, but then slowly reveal their depths. The role of the Count is somehow both essential and secondary. Adele, who commands the first half hour of the play, never shows up again once she declares her betrayal. Oscar repeatedly mentions his “weak heart” in Act 1, but nothing ever comes of it. And the influence of another Oscar – Oscar Wilde – is felt in the twisty final scene. Playwright Molnár would have been about 17 when Wilde’s The Importance of Being Earnest premiered, so one can imagine the influence Wilde had upon his career. 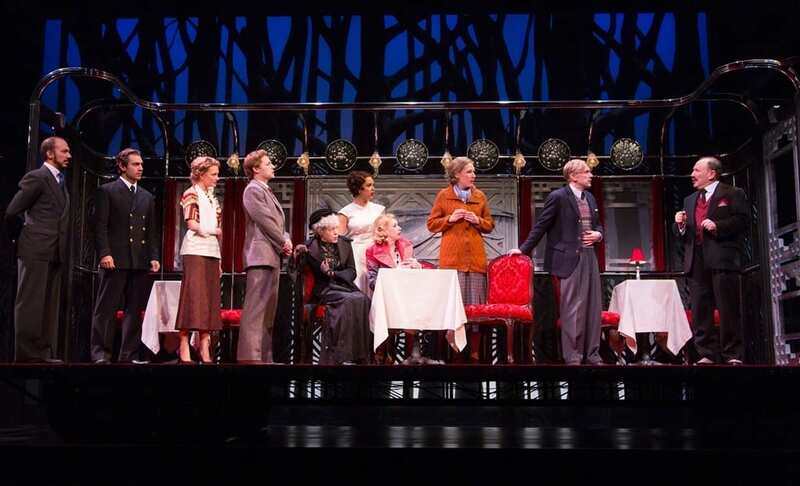 It’s another solid, ambitious and impeccably dressed production by the Mint. Daniel Zimmerman’s settings are stellar, and costumer Martha Hally shows herself to be at the peak of her career, giving us the best-dressed Off-Broadway show of the season. WITH: Mark Bedard (Adolph/Santha/Nervous Gentleman), Joe Delafield (Peter Juhasz), Jeremy Lawrence (Philip), Rachel Napoleon (Paula), Annie Purcell (Adele/Dissatisfied Lady), Kurt Rhoads (Count), Michael Schantz (Young Gentleman/Mate/Cabman), Maren Searle (Delivery Boy/Thorough Young Lady), John Seidman (Domokos/The Old Gentleman), Jill Tanner (Aristocratic Lady), John Tufts (Oscar), and Gabra Zackman (Unassuming Lady/ Patient Lady). Sets by Daniel Zimmerman; Costumes by Martha Hally; Lighting by Eric Southern; original music and sound by Jane Shaw; production stage manager, Allison Deutsch; presented by the Mint Theater Company, 311 West 43rd Street; 866-811-4111, www.minttheater.org, Through March 29th. Running time: 2 hours 40 minutes (two intermissions).